Happy Valentine's Day, dear readers! I actually had trouble with this EBEW challenge. I do have red and pink pieces in my wardrobe, but nothing that really works together (or with my usual style), so I knew I was going to have to fall back on accessories. Moreover, I was worried that I'd be putting pieces together purely for the sake of participating, without much hope that the outfit would be anything I'd wear again. I'm pleased to say, however, that I might wear this combination without or without a Valentine's Day Challenge! 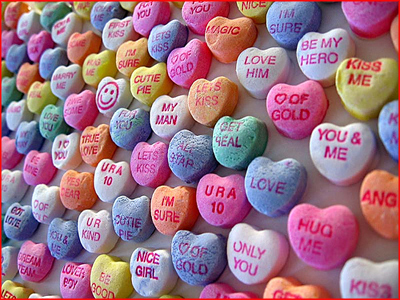 And now, sweethearts for all! Perfect, as always. Happy Valentines to you, chickadee.